Dormant monitoring helps to decide whether to pursue treatments of some pests (primarily scales and mites) in the dormant or delayed dormant period. This timing can be quite effective. Coverage tends to be very good since there are no leaves in the way of the application. Additionally, most natural enemies are not active during these times. Consequently, pest numbers can be reduced without simultaneously harming natural enemies – leaving those ‘good bugs’ to continue controlling pests during the growing season and further enhancing your IPM program. European red mite eggs. European red mites are an important early season food source for predatory mites. Obviously, dormant season treatments are not a panacea for all orchard pests and come with risks. Runoff can be a big problem during the dormant season – especially when rain is in the forecast or soils are already saturated. Costs may not be as inexpensive as in-season applications. And while dormant oil applications provide excellent control of brown mite or European red mite, they do not control webspinning spider mites, which are usually the most problematic mite during the growing season. To add insult to injury, using a dormant spray on low populations of brown mite or European red mite can suppress these populations enough that predator mites, which feed on brown mites/European red mites early in the season, will starve before the spider mites make their unwelcome appearance. The goal of monitoring is to maximize the benefits of a dormant treatment by making sure the pest that you are targeting is actually there and in enough numbers to be responsible for lost profit down the line. Dormant monitoring can be done anytime between November and January; although for almonds, January is on the late side if you determine the need for a dormant treatment. 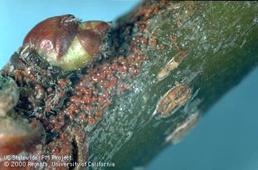 For both almonds and walnuts, the basics of monitoring are the same: examine spurs or branches for the presence of target pests, determine whether they are abundant enough to merit treatment, and make an informed decision on treatment type and timing. To monitor your walnuts, examine scaffolds and branches throughout the orchard. To better survey what’s occurring at the top of the canopy, consider following after a pruning tower or hedger and looking at the pruned branches for the various pests. Decision tree for making treatment decisions of walnut scale, San Jose scale, and frosted scale. Click to enlarge, or download a .pdf version. 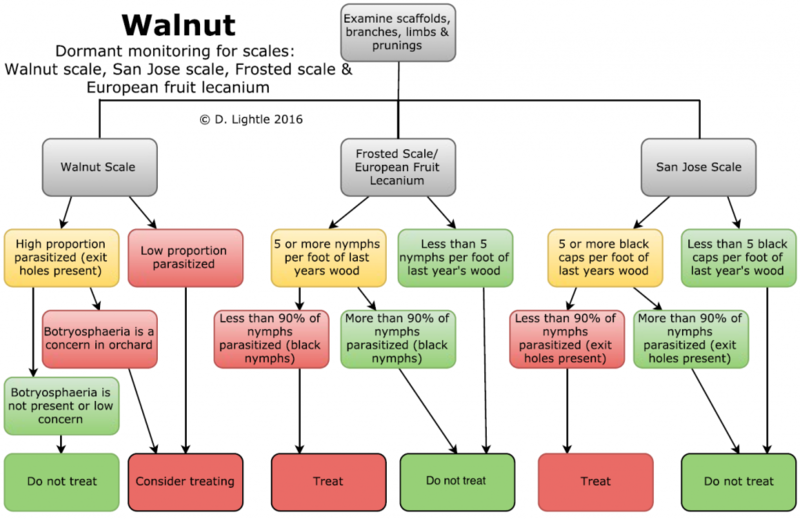 For more information on pest identification, monitoring, and treatment options, see the the UC IPM Walnut Dormant Monitoring Guidelines.